Jackson Square contains buildings which are the sole survivors of the early central business district of San Francisco. They are the only physical reminders of the city's beginnings as a great port and mercantile center. Jackson Square, hastily developed in Gold Rush days as an extension of the original commercial center at Portsmouth Plaza, was in fact built on fill, including abandoned ships [for example Niantic and Apollo] which still underlie some of the buildings. During the 1850's this newly filled area which directly adjoined the piers to the east was dominated by merchants, banks, professional and government offices, assembly halls and places of entertainment. The wares sold included books, crockery, glassware, stoves, plumbing materials and the like. 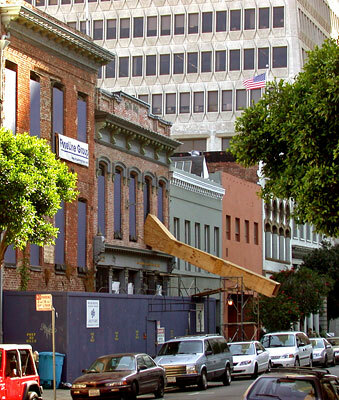 During the 1850's and 1860's, Montgomery Street was the principal thoroughfare of the young city, but only a few buildings in the 700 and 800 blocks survived the fires of the 1850's and after and the major earthquakes that struck the city between 1868 and 1906. After 1870, as the business district moved south and west, many buildings lost their more distinguished occupants. From professional and retail, there was a change to manufacturing and wholesaling: liquor and tobacco dealers, cigar factories, leather works and later printing and paper warehousing. This trend continued through the early decades of the 1900's. The great depression of the 1930's further weakened both the industrial and commercial bases of the Jackson Square area and many buildings became vacant. Starting in the early 1950's, the historical and architectural merit of the area was rediscovered by the growing new wholesale furnishings and decorators industry. The attention recently lavished on these old structures well illustrates the primary lesson of Jackson Square's history — its proven adaptability to changing uses without losing its essential historic form. Another side of this area's history marks San Francisco's legendary appeal to pleasure-seekers as well as goldhunters. For if the buildings on Montgomery and Jackson Streets are the oldest, those on Pacific Avenue too embody a story, and represent institutions, equally old and unique in reputation. From the 1850's on, the area to the south of Telegraph Hill, especially Broadway and Pacific Avenue, had an unsavory but international reputation, for the harboring, of lawbreakers. By the 1880's, when the phrase Barbary Coast arose, the foundations had been well set: for half a century lodging houses, saloons, dance halls, cheap shows and related establishments were to dominate the scene, largely populated by sailors, pimps and prostitutes. Almost wholly destroyed in the Earthquake and Fire of 1906, the buildings were rebuilt to substantially the same scale, appearance and uses as before. The Barbary Coast enjoyed its peculiar reputation until the First World War; but police raids, Prohibition and finally the depression dealt it a series of crushing blows. The 1939 World's Fair brought a brief revival, when enterprising promoters took advantage of the tourist trade to reopen the old deadfalls with less dangerous, though perhaps more expensive, night-clubs and saloons, dubbed collectively the International Settlement. 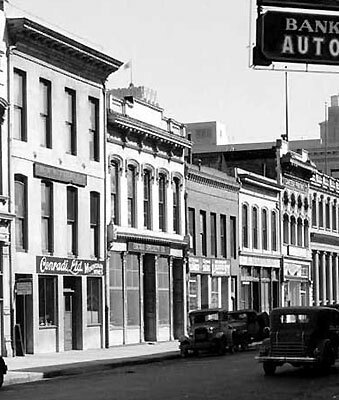 By the early 1950's, the buildings on Pacific Avenue, like those on Jackson, Montgomery and elsewhere in the area, stood largely idle and vacant. During the revival started then by the decorators and wholesale furnishers, the Barbary Coast benefited equally with its older and more sober neighbors to the south. There has been a coalescence of two sub-areas different in origin and development but substantially united in scale, basic character and present use.